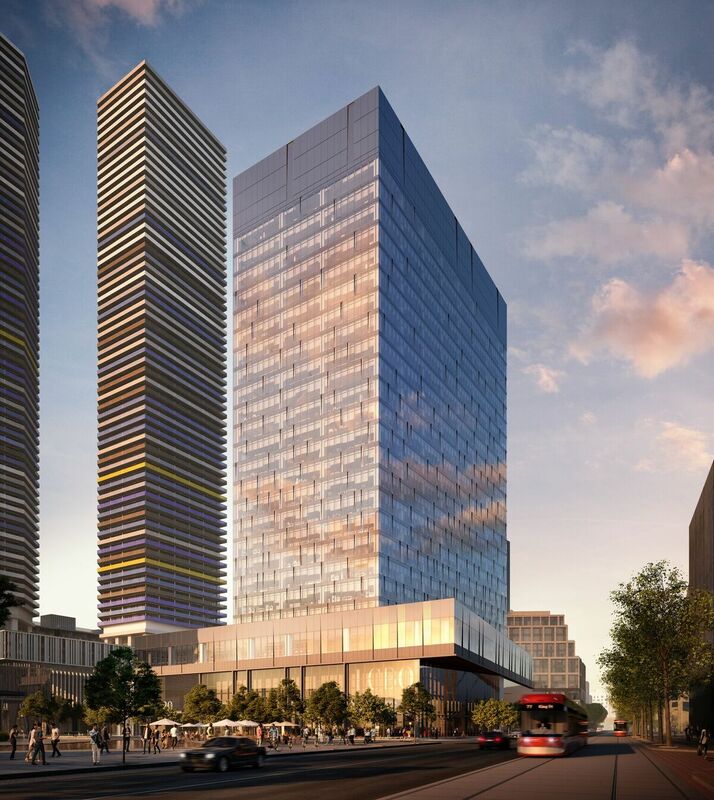 Yesterday, the ceremonial ground was broken on a new office tower on the Toronto waterfront at 100 Queens Quay East, which has been under construction since late 2017. Designed by B+H Architects, the office tower is the first phase of a massive new mixed-use community dubbed ‘Sugar Wharf,’ which will include employment, retail and residential uses, a new public elementary school and a new two-acre public park. The 25-storey commercial tower is set to be joined by five residential towers designed by architectsAlliance. Developed by Menkes, Greystone, and Triovest, the Sugar Wharf community will be located on an 11.5-acre property, located at the northeast corner of Queens Quay East and Freeland Street, one block east of Yonge Street. The development site was purchased by the Menkes partnership group in 2016. Currently, the Liquor Control Board of Ontario (LCBO) occupies three buildings on the property, a retail store, a four-storey office building and a warehouse facility. The B+H-designed office tower at 100 Queens Quay East. Rendering via Brandon Communications. The new office tower at 100 Queens Quay East will be a 25-storey building, featuring approximately 690,000 square feet of Class “AAA” space. B+H conceived the tower with the objective of achieving the highest standards in environmental sustainability by striving for LEED Platinum certification. Leadership in Energy and Environmental Design (“LEED”) is an internationally-accepted rating system that recognizes excellence in the design, construction and operation of green buildings. In addition to the new office tower at 100 Queens Quay East, the master-planned Sugar Wharf community will include significant retail and residential components. There will be approximately 300,000 square feet of multi-level commercial retail space, including a new flagship LCBO store, as well as a new grocery store. The residential component of the community will include five condominium towers, varying in height from 64 to 90 storeys, and a mid-rise rental building. The development will also pay tribute to the previous historic uses on the lands by integrating key elements of the existing LCBO office building and warehouse into the project and the creation of a vibrant heritage mews. Situated north of the office tower and a park space fronting Queens Quay, five architectsAlliance-designed residential towers will add a massive influx of density — and height — to the area. Ranging in height from 64 to 90 storeys, the community’s residential residential would feature a height peak of over 300 metres, featuring one of Toronto’s — and Canada’s — first ‘supertall’ structures. Still in an earlier stage of the planning process, the finalized designs for architectsAlliance’s towers have yet to be revealed, though the sheer scope of the project is already garnering attention. Sugar Wharf’s public park space, showing the early-stage renderings for the residential tower bases. Rendering via Brandon Communications. If built as currently planned, Sugar Wharf will be the largest mixed-use development on the Toronto waterfront, with between 4,000 and 4,500 people working in the community, plus a resident population ranging between 7,000 and 8,000 people upon completion. “This new mixed-use community hub will provide new homes, a school, a public park, and help attract business and job opportunities. Investments like these help bolster Ontario’s economy while providing convenience for consumers and improved quality of life for people,” said Charles Sousa, Ontario Minister of Finance.